we LOVE caramel in this house. we will eat it on pretty much anything, or even nothing if it comes to that. we just can't get enough. 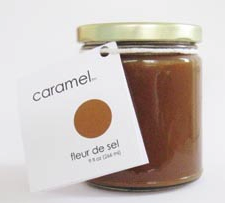 for a while there we were 100% devoted to this deliciousness, but the other day while i was perusing the we love jam site for some blenheim apricot jam i discovered a little extra treat ... fleur de sel caramel. well i couldn't pass it up (come on could you?). it finally arrived last night, and well, it is the most delicious caramel i have ever tasted. we spooned out half the jar into our bellies and now are in need of more. buy some, NOW. you won't regret it. Have you ever made your own caramels at home? It's a great way to spend a rainy day or night. A few weekends ago we tried Alton Brown's sea salt caramel recipe and it was delicious! Yep, it can go very, very wrong. You definitely a stovetop that is a team player, and an accurate candy thermometer. Here's to unbroken teeth. ha! i took one look at that picture and thought, "wow, somebody ripped off the "we love jam" packaging...". awesome, i had no idea they had so many other products now. oh, and try your caramel in some yogurt. the sweet saltiness of the caramel combined with the tanginess of yogurt is pure heaven.